Beijing Daxing International Airport is a new airport construction project which will serve Beijing, China. The project is expected to cost CNY80 billion (USD13.1 billion) in total, with construction work commenced in Dec-2014. Once completed in 2019, the airport will have capacity to handle 45 million passengers p/a during the initial stages, 70 million passengers by 2025 with plans for expanding the facility into an airport capable of handling 100 million passengers p/a. Meanwhile, an air transport-related economic zone is also planned, with an investment of CNY84 billion (USD13.4 billion). This figure is still speculative. planned capacity whilst even secondary hubs are starting to experience capacity strains. Since the large surge in Asian airport developments in the 1990s, infrastructure has rarely been built ahead of demand. This is a cause for concern, owing to Asia’s predicted high rate of growth and given that runway and terminal projects typically require 5-10 years from need recognition to implementation. As a consequence, congestion-related delays are rapidly increasing at most Asian hubs. Passengers experience increasingly common flight delays, long queues for take-off, and circling of aircraft in stacks prior to landing. Availability of suitable landing and take-off slots is suddenly becoming scarce, leaving airports unable to cope with any further growth, and leaving airlines with nowhere to operate their newly delivered aircraft. Therefore, it is not surprising that in 2013, only 57% of departures from Asian airports were on time. This number is considerably lower than for airports in North America and Europe, which boast 79% and 73% of departures on time, respectively. Beijing spent USD3.5 billion to build what was the world’s largest airport passenger terminal. However, China’s national planning agency has given the go-ahead to a new airport that will cost nearly four times as much. Beijing International Airport’s Terminal 3 was built just in time for the Beijing Olympics in Mar-2008. It is a sprawling 10.6 million square foot complex. Despite the major expansion, Beijing International Airport, Asia’s busiest, has struggled to handle passengers, leading to delays that have become legendary among frequent travellers. Beijing Airport reached its design capacity in 2013 of 75 million. The airport plans to complete overall construction in Jul-2019 and commence trial operation in Sep-2019. 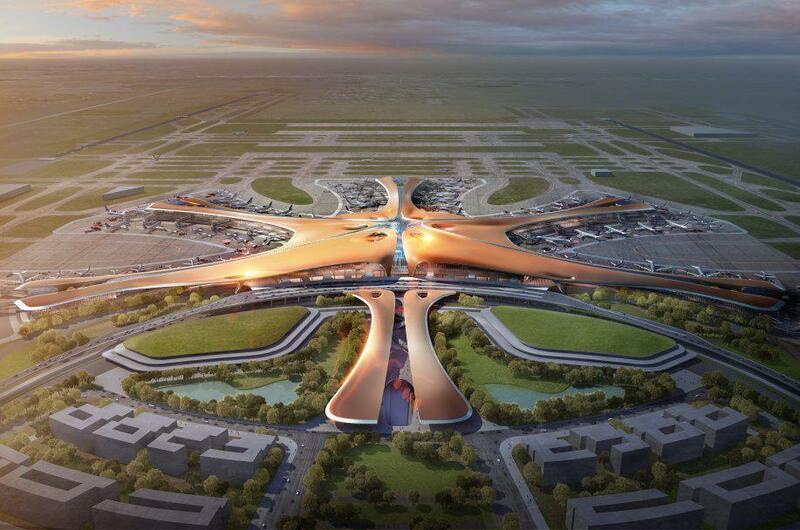 Chinese government has recently announced the opening date for the Beijing Daxing International Airport. According to the authorities, It is expected the airport will officially begin operations on 1st October 2019. It is also speculated the new airport which has not received any official name yet will accommodate 620,000 flights per year.